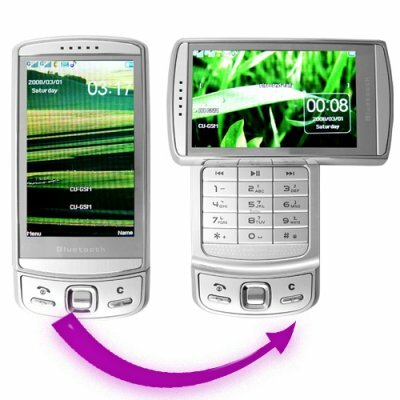 Successfully Added Quad Band Swivel Screen Cellphone With Accelerometer (Silver Ed) to your Shopping Cart. Quad Band Swivel Screen Cellphone with Accelerometer. This four band GSM (850MHz, 900MHz, 1800MHz, 1900MHz) multimedia cellphone has Bluetooth, Dual SIM, TV, FM radio, and large 3 inch polarized LCD screen as it signature features. This is a truly video friendly multimedia mobile phone with its rotating LCD display (portrait or 16:9 widescreen). Not only does the screen rotate, but the images/videos on the screen change from portrait to beautiful landscape mode. You may find yourself watching videos or TV on the great looking wide screen and wish your daily commute to the office was longer! All of the cool multimedia features are here, including TV, FM Radio, MP3/MP4 players, digital camera and video recorder, image viewer, ebook reader, and accelerometer. The internal micro SD card slot already contains a 1 GB card, so the phone comes out of the box ready to start taking pictures and loading up ringtones. While the brand new navigation menu system developed especially for this particular phone makes accessing all the features a breeze. Lets not forget that this is not only a fun digital media phone, but also a useful business phone. With native quad-band GSM/GPRS to keep you connected all around the world and dual SIM with dual standby allowing you to have two active phone numbers in the same phone - this phone is the active persons dream come true! A great looking phone packed with awesome features and available right now at a great wholesale prices with no M.O.Q. (no minimum order quantity) from Chinavasion. Great quad band cell phone and digital life device. Dual SIM cellphone with dual standby. Built in TV and FM Tuners and a very good MP3 player with equalizer. When will this phone start supporting the Russian, Italian, or __________ language? This phone supports the languages shown in ths product description above. If you are planning to order a large quantity, 50+ pieces, we can accommodate requests for additional languages. on 2009-07-12 01:43:22 Excelent !!! I can truly recommend this phone to all buyers, has some fantastic features that are not even found on some of the popular branded phones. Keep up the good work Chinavasion! wonderfull product, nice performance, is a 5 starts product.